There is, however, one area of your life where you may be able to recapture some of your free time. Rather than having to spend hours of your precious spare time caring for your lawn, why not hire The Lawnsmith to manage your outdoor space on your behalf? As you might expect, services provided by The Lawnsmith predominantly focus on your lawn. Many lawn care services are available; perhaps you’re just looking for weekly mowing to be performed, or perhaps you need assistance to create the clean, detailed power edging you have always wanted? Either way, The Lawnsmith is here to help! In addition to lawn maintenance services, The Lawnsmith is able provide a variety of additional yard-related services, with options ranging from seasonal-appropriate cleanup work to shrub trimming, weeding, and sod installation. These services, and many more, can be read about in more detail on our services page. Whether you opt for lawn services only or more expansive options that cover the rest of your garden, you can be sure that The Lawnsmith team with deliver high-quality and reliable services every single time. Garden and landscaping inspiration courtesy of The-Lawnsmith.com! As well as providing an outstanding level of service when hired onto a job, we go above and beyond for the residents of Minneapolis and provide free advice right here on our website! We’re committed to ensuring our customers are able to enjoy the very best their outdoor space has to offer, so we are delighted to share our expertise - honed over 25 years experience - with a number of posts designed to spark your imagination regarding your outdoor space. For example, we’ve shared our favorite tips that will allow you to "Rock Your Summer" both figuratively and literally. We’ll also offer seasonal tips, such as How To Care For Your Garden In Winter - though you probably don’t want to think too much about winter in the midst of our beautiful summer! No worries - these tips will be useful in November, too. As you can see, we at The Lawnsmith are dedicated to going above and beyond when it comes to ensuring customers have the full service they need. You can peruse ideas for how to make the best use of your outdoor space, safe in the knowledge that you can hire the highly-experienced Lawnsmith to create and maintain the lawn you've always wanted. So reclaim your free time today! Whether you wish to inquire about weekly mowing services or discuss an idea for your outdoor space that you’ve found in our blog posts, we look forward to hearing from you. We offer free estimates, so head over here to get a quote for your project. 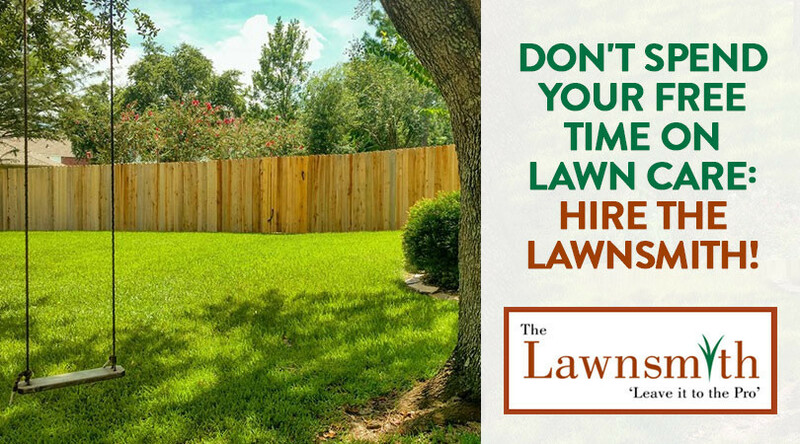 Hiring our team means you can focus on using your free time to do the things you love, safe in the knowledge that your outdoor space will still be as beautifully maintained as ever thanks to The Lawnsmith!